Following their reinterpretation of Batman’s origin with Zero Year, the critically acclaimed creative team of Scott Snyder and Greg Capullo bring us Batman Endgame, the story to end all Batman stories. Batman #35’s new story arc brings the series back to the present, where Batman Endgame is set during timeframe of the events and continuity that will be established after the conclusion of DC’s weekly series, Batman Eternal. 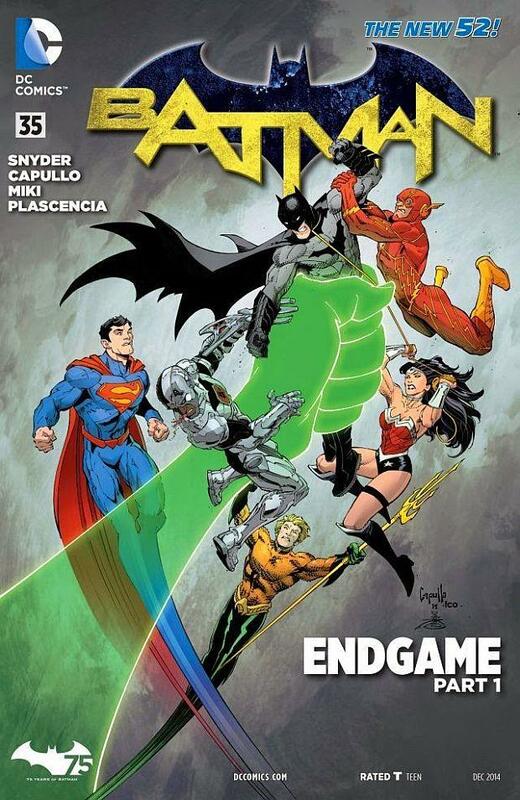 Batman Endgame is Scott Snyder’s and Greg Capullo’s big story event for Batman’s 75th anniversary, and they’ve crafted their deadliest and most exciting adventure yet to celebrate this momentous landmark for the Dark Knight. Batman #35, with its opulently crafted prologue and quick flash forward, gives us plenty to ponder over before Batman Endgame Part 1 begins in earnest in the present. With its subtle references to Zero Year and The Court of Owls, we rejoin Batman following a run in with the Scarecrow, where Scott Snyder quickly establishes a new set-up: Alfred is well on the road to recovery, its good to see his daughter, Julia, is still around too, and we also find that Bruce has moved into a new high-tech base in a very familiar part of the city. 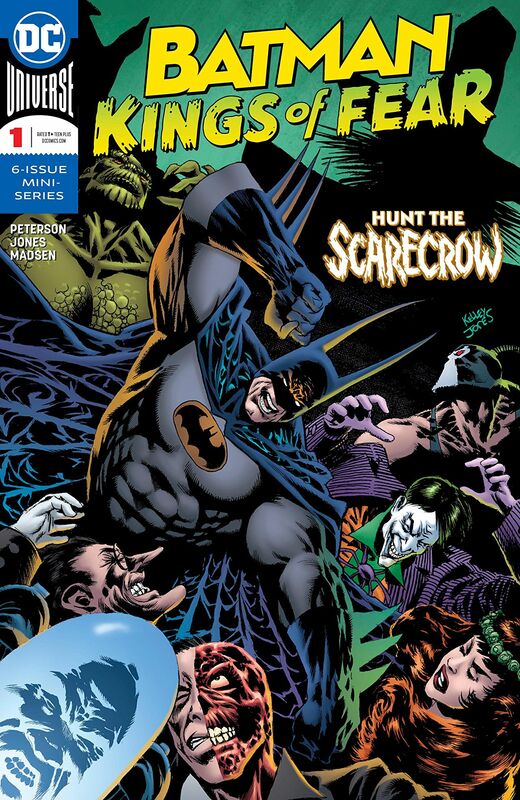 From here Batman #35 hit’s the ground running and the excitement doesn’t let up for a moment! If anything, the no-holds-barred smack down that takes up the bulk of this issue is so well thought out, and so ingeniously clever, that you’ll be left thinking half way through the issue about how the hell Scott Snyder and Greg Capullo going to top this? That’s just in the first few pages, and you won’t have even finished the issue yet. Suffice it to say, this is a battle like no other you’ve ever seen before, and it makes you wonder what other contingence plans the Dark Knight might have secretly prepared for. Greg Capullo’s art for Batman #35 is as breathtaking as ever, from the beautiful crafted opening, with stunning aerial views of Gotham, followed by a quick look round the new base of operations, Capullo throws us into the midst of Batman’s battle royal with the Justice League – and it’s a fight that will quite simply blow you away! Greg Capullo has gone all out for Batman’s slugfest with the Justice League, the action is fast and brutal, the “Justice Buster” suit is magnificent, and the way it functioned in this issue was brilliant. The inks by Danny Miki bring added texture and energy to every page, the scenes in the theatre look amazing, and the action feels even more intense with Miki’s excellent ink wok. FCO Plascencia’s colors enrich every page, with vivid hues for the aforementioned early glimpse of the theatre, through to the clinical opaqueness of the new base, and the battle with the Justice League sees FCO’s colors mirror each Leaguer’s abilities perfectly. 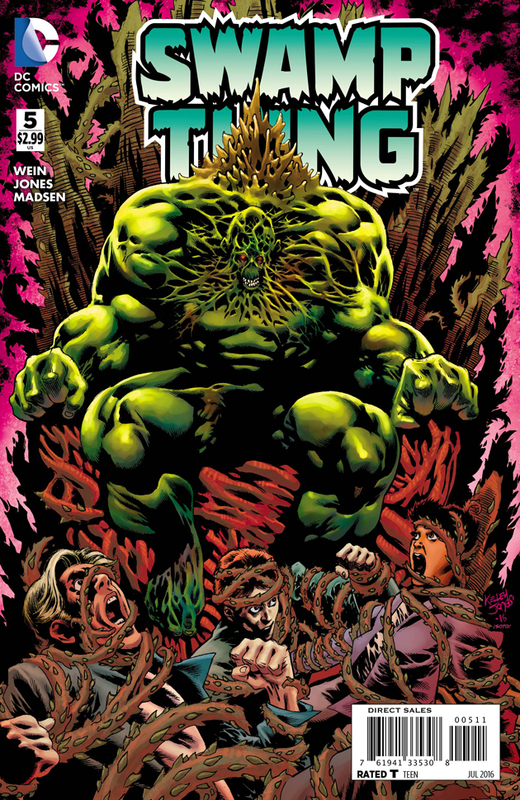 Batman #35 also features a backup story, The Pale Man, and the way this links into the main story arc of Endgame is ingeniously done, written by James Tynion IV, with fantastic art by Kelly Jones, and colors by Michelle Madsen, this dark tale follows the escape of five inmates from Arkham. Doctor Zaheer gets some late night visitors on her return home from Arkham Manor, tortured souls who each have a story they must divulge. The Pale Man is a frightening glimpse beyond the veil madness, James Tynion IV weaves a macabre web of intrigue here, which together with Kelly Jone’s art, creates a brooding atmosphere of gothic horror. A masterfully structured tale, it will be fascinating to see how these events will tie-in to the main arc of Endgame. Its clear that from the outset that the landscape of and tone Batman Endgame is influenced and woven into the shared fabric the current bat-titles, while also drawing on elements established throughout Snyder’s and Capullo’s run; and Snyder ensures that everything knits seamlessly together in a way that’s easily accessible to new readers as well. Batman Endgame gets of to a great start with this issue, setting the groundwork for this epic to unfold, and delivering one hell of a shock ending that will catch you completely off guard. Batman #35 is the start of something really special; Snyder and Capullo have excelled themselves once again with this issue, and with its surprise ending Batman Endgame looks set to be one of their best stories ever!